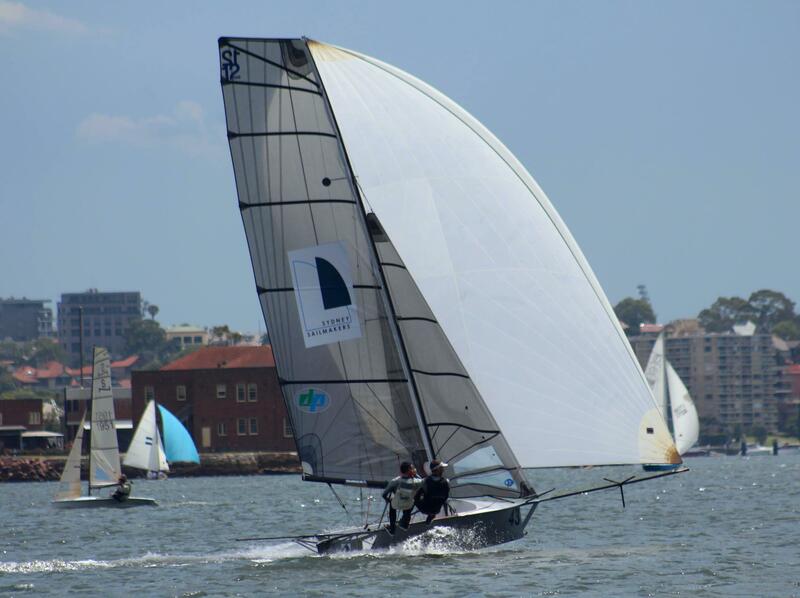 Lincoln Crowne (Jonathon Temple/Richard Jones) may have got the early jump at the start, but the Sydney Sailmakers crew of Nick Press and Andrew ‘Noddy’ Hay dominated from there to win in the 12ft Skiff Upper Harbour Championship, hosted by the Lane Cove 12ft Sailing Skiff Club today. Press and his new crew Hay, who is more at home on an 18 foot skiff, posted a resounding two minute 22 second win over nearest rival Geotherm (Brett Hobson/Bill Lusty), which in turn pipped Lincoln Crowne by one second in a thriller to the finish. Press and Hay also won on handicap from Bigfoot Foot Custom Trapeze Harnesses, which is normally skippered by his father Murray, but in his absence today, was steered by Nick Press’ former crew, Andrew Stevenson. The easterly course took the fleet from the start off the host club, taking in Valentia Street, Manns Point West, Drummoyne Wharf, Spectacle Island, Birchgrove and the finish off the Club. “Lincoln Crowne rolled us and Geotherm at the start, but we got in front after that and pretty much led around the course. Bigfoot Foot Custom Trapeze Harnesses (Stevenson and Scott Lanham) was second out of the (Lane Cove) River,” Press, the winner of six Interdominion titles, said. ”It was tight coming back through the Humbug – and Lincoln Crowne nearly got Geotherm right on the finish line,” he said of the race, which was predominantly sailed in a 10 knot easterly breeze. The light breeze made it hard work for the crews, particularly the new combinations, to stay afloat, so there were the customary capsizes. “We nearly had a couple of swims too,” Press admitted. “It’s harder holding the 12 upright in lighter breeze, but we had a nice pleasant sail in conditions that were good for big rigs and for everyone,” he ended. Thirteen boats started the race, but 12 finished when Skoll (Pete Polac/Rob Joyce) was involved in an altercation with a Laser, forcing their retirement. The Upper Harbour Championship is one of the major lead-ups to the prestigious 12ft skiff Interdominion to be hosted by Auckland Sailing Club in New Zealand from 2-9 January, 2016. The next event on the ‘12s’ calendar is the Parramatta River Championship, to be hosted by Abbotsford 12ft Flying Squadron on Sunday, 25 October. This entry was posted in News, Race Reports on October 17, 2015 by Skiff-Ed.